Porridge. Such an old-fashioned culinary marvel and yet I couldn’t think of a better way to describe this hearty hot cereal. Then this month’s Recipe Redux challenge required use of a crock pot (or slow cooker for some of you), my mind immediately went to hot cereal. Perhaps driven by the fact that, almost from the moment I learned I had to give up gluten, my favorite foods that I once took for granted started to haunt my dreams. Although beer is probably the casualty I miss most, I have to say that Irish oatmeal (or maybe you call it steel cut oats…you know, the kind that takes a loooong time to cook?) comes in a close second…especially at this time of the year. 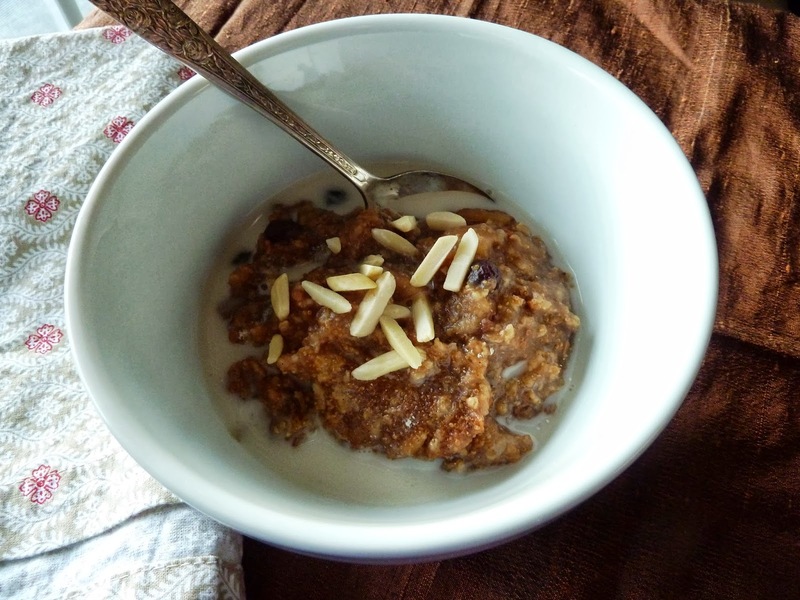 Which got me to thinking…perhaps if I tossed a variety of gluten free grains into a slow cooker with a bunch of other yummy things, I would have a hot and hearty cereal that would be an acceptable substitute for oats (a tall order). 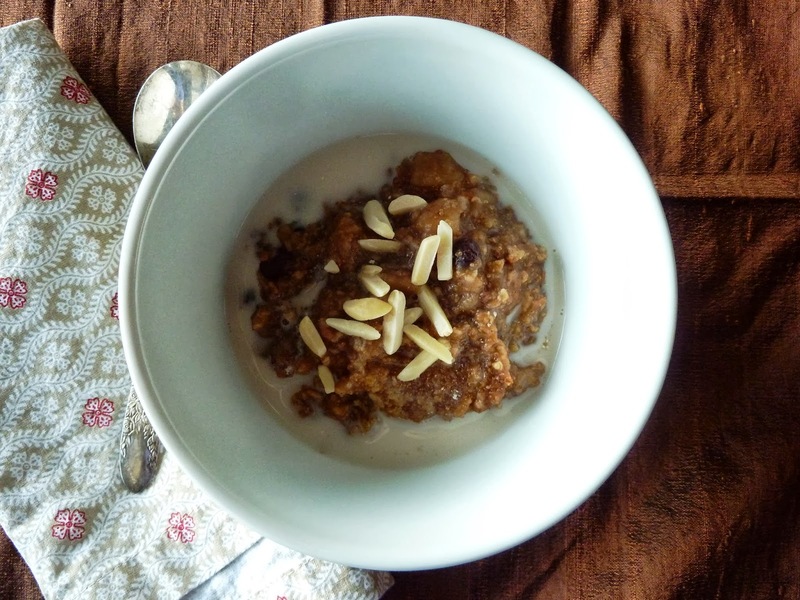 Turns out that, while the texture and flavor of the end result is decidedly not like oats, this cereal is still a delicious (and health) start to the day. I have to admit, when I lifted the cover from the slow cooker in the morning, this cereal wasn’t the most beautiful thing I’d ever made. Fortunately, as with most things in life, one must not judge a book by its cover. This is a deeply earthy dish (thanks in large part to the buckwheat) and has a hearty “stick to your ribs” (as my dad would have said) texture. I also used millet, which has a good amount of B vitamins, iron, calcium, potassium, magnesium and zinc (all great for fueling your day!). The third grain in the recipe is amaranth, also a good source of vitamins and minerals as well as protein and fiber (interesting fact: people who avoid gluten often do not consume enough fiber). Add to these molasses, plump raisins, lots of cinnamon and apples and you have the making of a perfect way to enjoy all of the beautiful bounties of the fall season. A couple of thoughts on how you could make this your own. If you don’t have to avoid gluten, try other grains such as wheat berries (a personal favorite until I had to give it the ax), farro, and steel cut oats (just be sure that the grains you choose all require about the same amount of cooking time). You could also choose your own favorite natural sweeteners (honey, maple syrup) and fruit (dried or fresh). So go ahead, rock breakfast like it’s 1899! I am obsessed with all three of these grains. I bet they’re delicious together! I love all of those spices. Such a great combination for fall. I pretty much jump at the chance to use cardamom….secret ingredient in lots of recipes!